The First True Bourbon Cream. Ever. 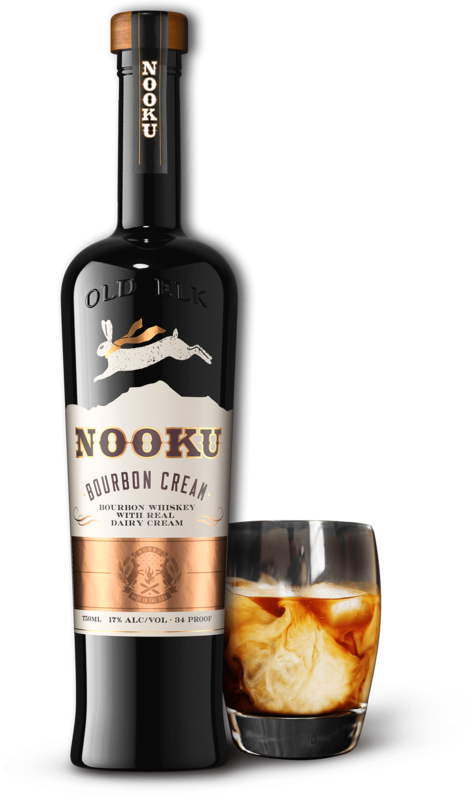 Nooku Bourbon Cream is the perfect balance of hard and soft, something sweet with a bold finish, a spirit unlike any other. This is a new experience in bourbon. The true matured straightforward taste still exists, but is now taken to the next level. Sip. Pause. Wait for it. There it is. A hearty bourbon finish in real dairy cream. Sweet treats are what the season calls for. Add Nooku Bourbon Cream to your hot chocolate for the perfect winter warmer! Rich, chocolatey and a bold finish. Combine 1.5 oz. Nooku Bourbon Cream and 4 oz. fresh hot chocolate. Stir until well mixed and top with whipped cream, marshmallows, and chocolate drizzle. A hearty, true bourbon infused with real dairy cream. That’s all there is to know. We crafted a spirit that’s authentic and purposeful, and took the time making sure it is just the right proportions of each. Great bourbon plus real cream. The perfect pair. Nooku is a Native American name for the white snowshoe rabbit. A strong, fast, bold and hearty, yet soft and smooth animal known for its lush coat and lightning speed. The same juxtaposition exists in our barrel-aged bourbon blended with ultra-smooth dairy cream. All the strength of bourbon with the delicate qualities of a decadent cream. This rabbit is not as elusive as one might think. We’ll provide you with a list of fine purveyors near you.